It seeks to provide government-run, Medicare-style health insurance. 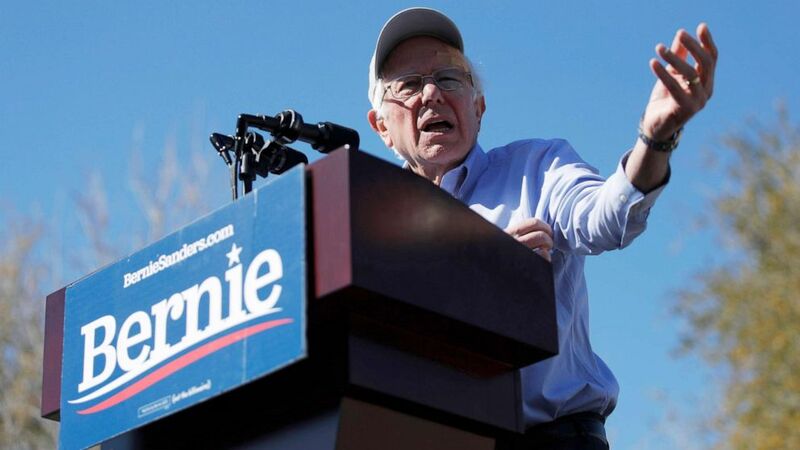 Sen. Bernie Sanders again introduced his signature health care legislation Wednesday, which if passed and signed into law, would provide government-run, Medicare-style health insurance for all Americans and outlaw most duplicative private insurance in the process. "The Medicare for All Act will provide comprehensive health care to every man, woman and child in our country without out of pocket expenses. No more insurance premiums, deductibles or co-payments. Further, this bill improves Medicare coverage to include dental, hearing and vision care," Sanders' team wrote in a summary of the bill distributed ahead of a press conference Wednesday on Capitol Hill. (John Locher/John Locher/AP) Sen. Bernie Sanders speaks at a rally in Henderson, Nev., March 16, 2019. Sanders has introduced the bill several times in the last decade, but the latest version is more sweeping. It now calls for expanded coverage to include and pay for long-term care, as well as no co-pays for doctors visits. The central idea of a single-payer, government health care system gained significant popularity within the Democratic Party during the 2016 presidential race when the independent senator ran largely on the issue. Rep. Pramila Jayapal, D-Wash., introduced a companion piece of legislation in the House earlier this year. According to Sanders' staff, this year's bill has been endorsed by 58 national organizations and unions, double the total from 2017, including the American Federation of Teachers, American Medical Student Association, American Sustainable Business Council, Americans for Democratic Action, Black Women's Health Imperative and more. Fifteen of Sanders' Democratic colleagues in the Senate signed on as co-sponsors of the bill too. Notably several of the other lawmakers running for president in the Democratic primary are listed in the group, such as current co-sponsors: Sens. Cory Booker, D-N.J., Kirsten Gillibrand, D-N.Y., Kamala Harris, D-Calif., and Elizabeth Warren, D-Mass. Still, several top Democratic Party leaders have disregarded the plan as too disruptive and expensive. Even in the Democratically controlled House, the legislation has not been a priority. Party leadership has instead pushed changes and updates to improve the Affordable Care Act. Counselor to the president Kellyanne Conway on Wednesday ridiculed some Democrats’ push towards Medicare for all as a sign that the party was not running on the so-called Obamacare law. "This is a government takeover," she said on Fox and Friends. "Folks, when you hear government insurance, don't just hear the word insurance, hear the word government. I gave birth four times. I didn't want uncle Sam and big brother in there with me." One study last year from the Mercatus Center at George Mason University estimated that Sanders' legislation could cost the federal government more than $32 trillion dollars over ten years. Sanders' team maintains that the federal government is already spending significantly on health care and that too many families go bankrupt due to medical expenses and the cost of private for-profit coverage. His plan offers few concrete deals on how to pay for the expanded federal system, but in the past the senator has backed significantly higher income taxes for wealthy Americans and businesses in the country. "Health care is a human right not a privilege," Sanders said. "Together we are going to end the international embarrassment of the United States of America -- our great country being the only major nation on earth not to guarantee health care to all as a right. That is going to end." As in the last, this bill calls for a four-year transition "phase-in" during, which time the government would incrementally lower the age in which Americans could buy-in to Medicare. "The American people are increasingly clear. They want a health care system that guarantees health care to all Americans as a right," Sanders said Wednesday." They want a health care system which will lower health care costs and save them money. They want a health care system which will guarantee them freedom of choice in terms of the doctor or hospital they go to." Seema Verma, the administrator of the Centers for Medicare and Medicaid Services, said the Trump Administration will "very soon" be unveiling its own plan that she said will be a "stark contrast" to the concept of "Medicare for All." But while Verma says the administration will be articulating its vision for healthcare, don't expect to see a legislative proposal from the White House anytime soon. "We're going to need the support of Congress to make changes and it’s not clear we have that support from Congress at this time," Verma said. When pressed about the president's stated desire to make a vote on a "great" Republican healthcare plan his first vote in a second term, should he win reelection, Verma said, "the reality" is that the administration needs a cooperative Congress before they can move forward with legislative solutions. "I think the idea would be after the election, when we have the appropriate support from Congress, to move forward with the solution that will work better than a government takeover of healthcare," she said. Even as the administration has backed a federal court ruling that would strike down Obamacare in its entirety -- including preexisting condition protections -- and has no legislative plan in the pipeline, Verma said the administration remains committed to such protections. "We have been very clear that we will protect people with pre-existing conditions," she said. "We are committed to that aspect and our plan will include protections for people with preexisting conditions."